Common issues we hear from our customers about the machine not cutting accurately, or “over-cutting”, are easily remedied with a combination of fine-tuning both blade alignment and the X,Y cutter offset. Continue reading to see example images of these issues and how to resolve them. 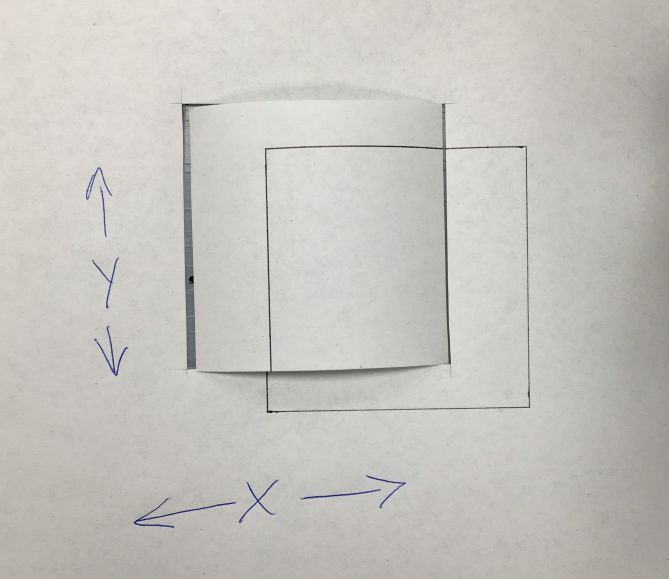 If you are experiencing issues with your plot lines and plot markings being in the wrong place when measured or compared to the original hard pattern, it’s likely your X/Y offset values are incorrect or slightly off. 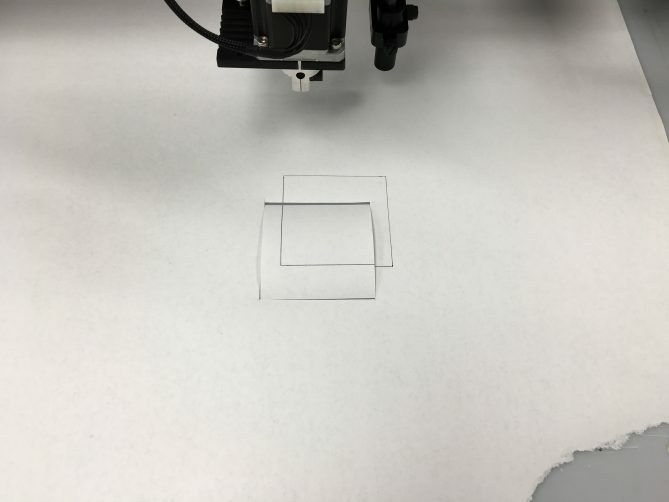 We must tell the computer the physical distance between the cutting tool and the marking tool so they are both in line with each other. 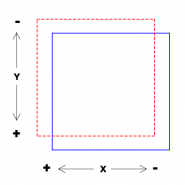 Below is a picture of an extreme example of what bad X/Y offset values look like when used to cut a simple square. 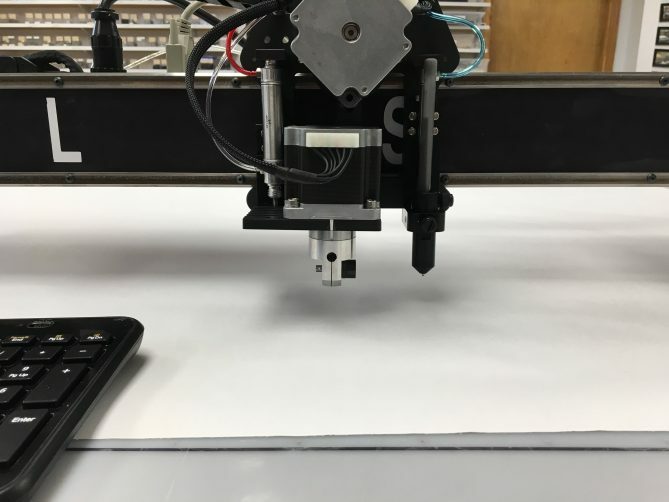 As part of the calibration process, the X/Y offset values for your machine is one of the biggest factors in cut accuracy. Using the example above, we are going to align the cut lines perfectly on top of the plot lines. This will ensure our plotting and cutting are in the correct places relative to each other. 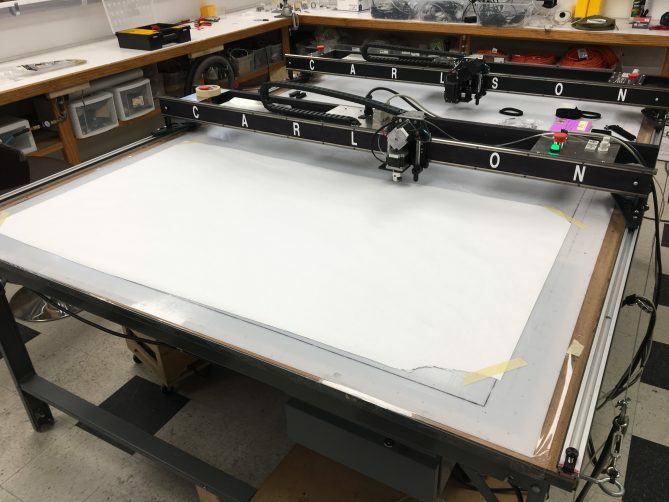 Prepare your table with a large sheet of paper. 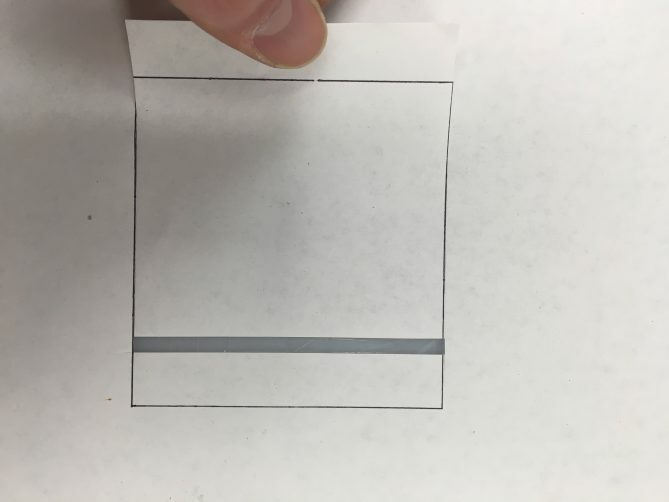 Tape the corners to ensure the paper does not shift during testing. It is also a good idea to apply vacuum to the paper while testing if your table is equipped with vacuum blowers. We then need to make sure our Z-axis is properly aligned. Do this by standing directly in front of the cutting head and aligning the two white marks using the “PgUp” and “PgDn” button on your keyboard until they are exactly on top of each other as pictured below. We will be solving this issue one axis at a time. We will begin by ensuring the X axis is cutting perfectly on top of the plotted rectangle. We will now open Plotmaster on the computer and go to the “Configure” tab located in the top right corner of the screen. Here you will see a set of input fields under the “Cutting” column titled “Cutter Offset X/Y”. 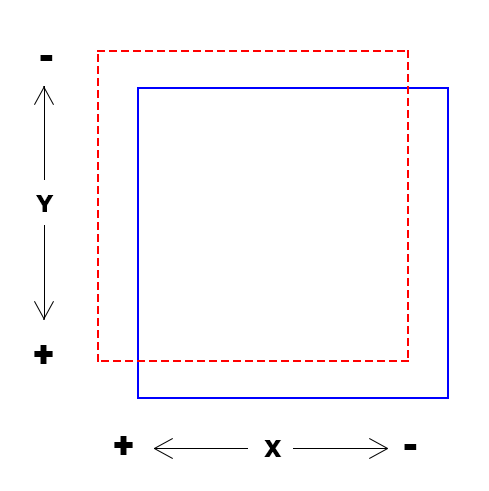 The first input field is the X axis values. Using our example, the value is incorrectly set at “.5″. 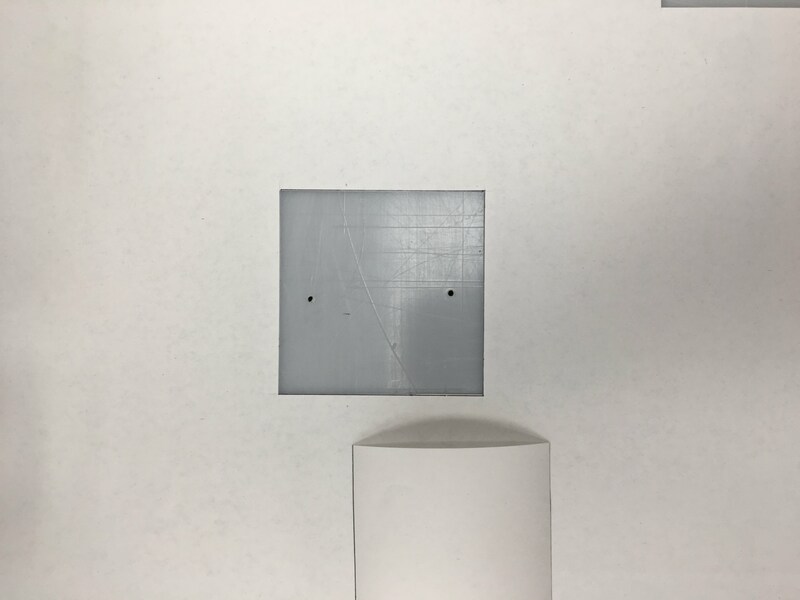 We then measure the distance between the far right edge of the cut square to the far right edge of the plot square. In this instance, the distance we are off is 29/32”. Using a calculator, we then divide 29 by 32 which gives us 0.90625. Referencing the chart below, we now subtract 0.90625 from .5 giving us a final value of -.40625. As you can see in the image below, our cut is now directly on top of the left and right edges of the plotted square. This is what we want. Now, we need to repeat the process for the Y axis. Repeating step 2, we will now measure the distance from the bottom of the cut edge to the bottom of the plot edge. This will give us our adjustment value. 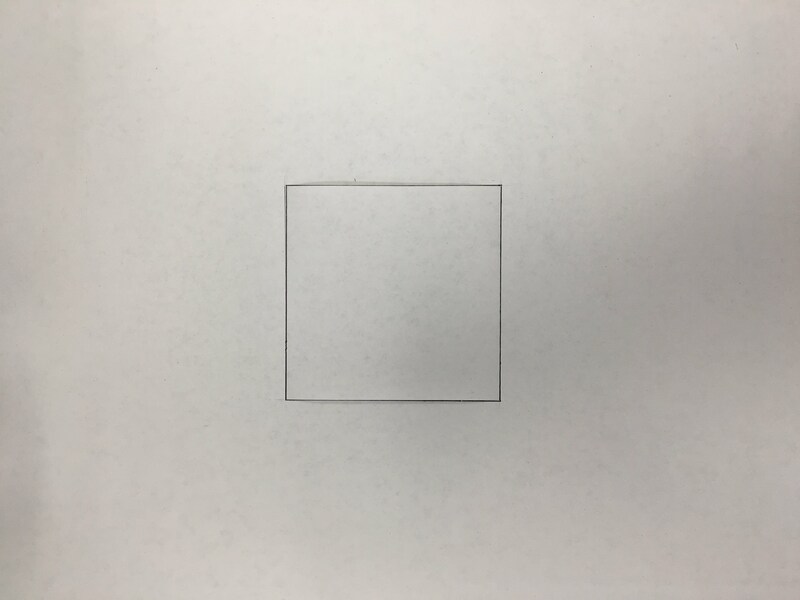 In this instance, the distance is 1/2″. Again, referencing our direction image above we know we need to add .5 to our Y axis offset value which is currently set at “2”. You should now be seeing the cut square directly on top of the plot square. If you notice it is slightly off in either direction, you can manually adjust the values in the “Cutter Offset, X, Y” input fields by hand. Simply click in the field and change either number in increments of 1/10 (0.1) either direction until you are 100% accurate.